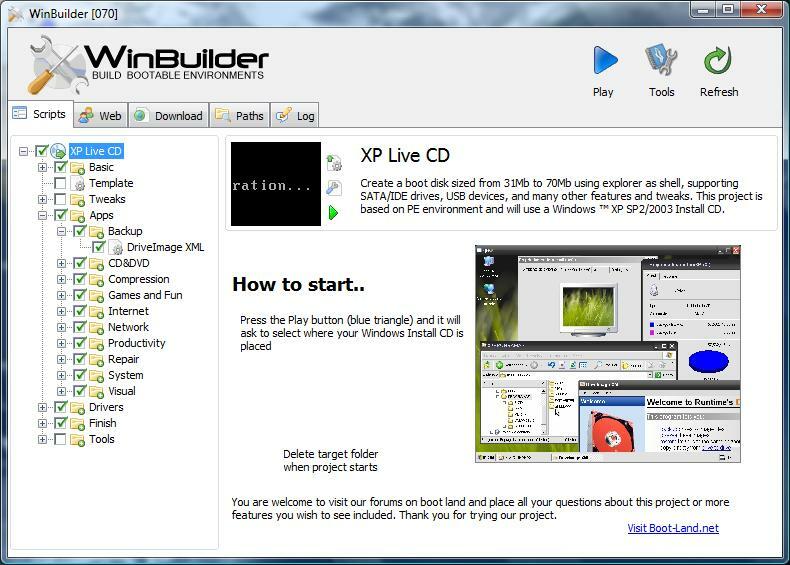 WinBuilder is a free application designed to create small bootable environments. Please visit http://winbuilder.net to view screenshots, projects and latest available versions. VistaPE - a project which completely customizes your Windows PE 2.0 which is available on Vista Install DVD's or inside freely downloadable WAIK from MS. More details can be found here. LiveXP project is designed to create a 31~100Mb ISO file and contains Explorer as shell, Small CD-Writer, Notepad, RegEdit, Task Manager, driver support for USB pendrives, USB mouses and SATA/Mass storage drives. nativeEx - the base project used for XP/2003 based builds, it is used to output a very slim and efficient result. NativePE - Also based on nativeEx, this project features some extreme customizations provided by thunn and other .script developers. picoXP - the smallest XP on earth! Not meant to be a joke because this project will really output a booting XP sized in 14Mb which can still be used to acess NTFS drives and use cmd.exe as shell. There is no support for GUI apps, only for console based tools. MobileOS - Turning a full sized XP into a portable OS which boots and run from RAM. This project is still on experimental stage and it is the solution for carrying your OS without limitations to just about anywhere. 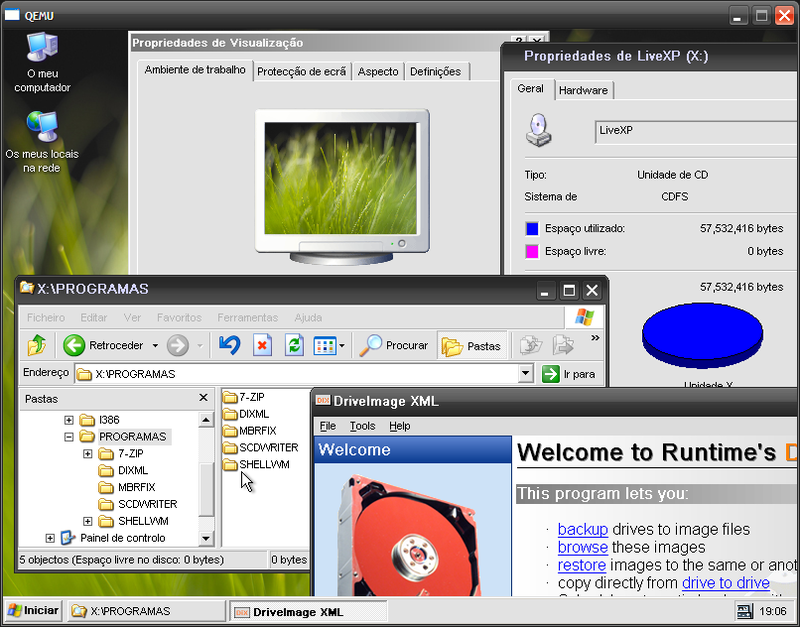 ReactOS is another project that is included for demonstration. It is an open source Operative System capable of running Windows programs, no need for external files from Microsoft, just press the Play button to create a boot disk based on this OS. BartPECore - Will use Bart's PE Builder as core for creating a PE boot disk and allow you to integrate plugins along with wb customizing scripts. How to start a project? LiveXP, nativeEx, nativePE, picoXP, bartPE Core and mobileOS projects will use files from a Windows XP SP2 Install CD or from a Windows 2003 R2. We really appreciate feedback. You're very welcome to write all your requests and place your doubts on the forums. Thank you for testing our projects..
Edited by Nuno Brito, 24 November 2007 - 06:18 PM.